Richard William DUGDALE was born on 9 November 1889 in Salisbury, Wiltshire. He was the second son of the Rev. Sidney Dugdale, from Eccles, Lancashire, a ‘Clerk in Holy Orders’. His mother, Edith, was the daughter of W. B. Marshall and was born in Egremont, Cheshire. He was baptised on 11 December 1889, at St. Martin’s church, Salisbury, Wiltshire. In 1891 the family were living at The Lodge, Manor Road, Milford, and Richard was then one year old and had an elder brother, John S Dugdale who was four and also born in Salisbury. There were five servants ‘living in’. Richard William Dugdale, Memorials of Rugbeians who fell in the Great War, Volume VI, Page 91. In 1901, Richard was a pupil at Woodcote House, South Stoke, Woodcote, near Wallingford. The family was now living at Westbury, Wiltshire, where the family lived at All Saint’s Vicarage, Alfred Street. His father was a ‘Priest, Church of England’. There were now two younger daughters, Margaret H, aged 9, born in Salisbury, and Edith J, aged 7, born in Motcombe, Dorset. The family could still afford five servants. In 1903, his mother died, aged 43. Her death was registered in Westbury, Wiltshire. Richard moved on to Rugby school, where he studied from 1903 to 1908. He was a keen sportsman, and when at Rugby, he had his football cap for two years, and several times played for the XV. He was in the Shooting VIII for his last three years and Captain in his last year; in 1907 he helped to win the Ashburton Shield. He was also a member of the Running VIII for three years and Captain in 1908, when he established a record for ‘the Crick’ by winning it in 1 hr. 12 mins. 20 secs. He also had his Cap for two years. He followed his elder brother, J. S. Dugdale from Rugby to Oxford University as an exhibitioner at Corpus Christi College. He gained a 2nd in Classics Moderations in 1910; and a 2nd in Literae Humaniores in 1912; He was Treasurer of the Debating Society in 1908, and was also an excellent oarsman, and rowed at for his college in Torpids, Eights and at Henley. He had also been a member of the University Contingent of the Officers’ Training Corps. He gained his BA in 1912; and then travelled in India. He took his MA in 1915. The 1911 census described him simply as an ‘Undergraduate Oxford’, and he was at home that night with the family at The Rectory, Whitchurch, Salop. His father had remarried on 3 May 1905 with Phyllis Price – the marriage being registered in Paddington Q2, 1a, 51. His address was then given as Lower Beeding Vicarage, Horsham. Her father was Richard Edwards Price, the Rector of Llanymynech. By 1911 there were two more daughters of that second marriage – Dorothy Mary, 4, born in Lower Beeding, Sussex, and Penelope Phyllis, 1, born in Whitchurch. The various birth places and census locations show the career moves of a vicar in that period. The number of servants also suggests that his ‘livings’ were good, and that public school fees could also be afforded. After taking his degree at Oxford, Richard trained for ordination to the Clergy at Bishop’s Hostel in Farnham, Surrey and was ordained Deacon at Worcester in December 1913 and a Priest a year later. He served as a Curate at Rugby from 1913 to 1915. Some of his activities whilst a Curate in Rugby can be found in the local paper and there are many complementary obituaries with information on his life and military career. HOLY TRINITY DEDICATION FESTIVAL. The dedication festival in connection with Holy Trinity Church held on Tuesday. The festival commenced with celebration of the Holy Communion at 8 a.m, at which there was a fair congregation. The Rector (Rev C M Blagden) was he celebrant, assisted the R W Dugdale (priest in charge). Matins was said at 10 a.m. and full choral evensong at p.m. There was a large congregation for this service, and the whole of the parochial clergy attended. The three choirs of Holy Trinity, Andrew’s, and St Peter’s Churches were present, and the singing, as usual on such occasions was of high order. … The first part of the service was taken by the Rector, and the second part by the Rev R W Dugdale …’. He was re-elected secretary, although he was ‘now in France’, for the Rector’s ‘Lectures to Men’ – and that last year had given three of the lectures himself. When War broke out, his request for leave to go and fight was refused by the Archbishop, but in June, 1915, he was accepted as an Army Chaplain and commissioned as a ‘Chaplain 4th Class’. 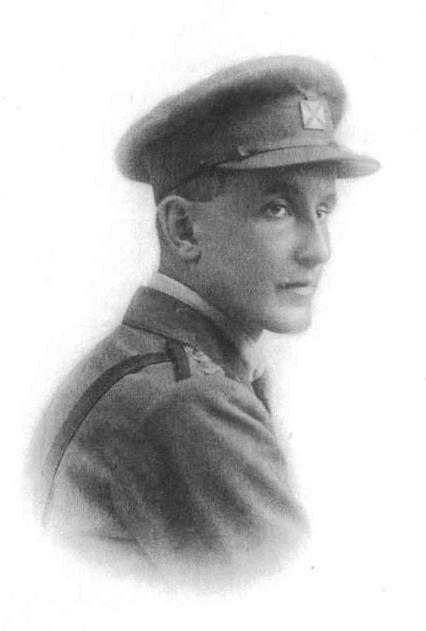 He went to France on 10 September, 1915, to join the Expeditionary Force, and straight into the Battle of Loos, and was attached in succession [in various reports] to the West Yorkshire, the Middlesex and the Cheshire Regiments, to the 5th Army Infantry School, to the Royal Flying Corps (13th Wing), and, in June, 1918, to the 1st Battalion, the Norfolk Regiment. He had been with the Norfolk Regiment for four months of fierce fighting when he met his death. He went up to the assembly position to be with the men for the night before an attack near Solesmes. The enemy put down a heavy barrage on the Brigade and he was killed on 23 October 1918. Age 28. He was certainly far and away the best Chaplain I have ever met, and one of the best fellows. The men just loved him, and no wonder. He was indefatigable in his efforts to increase their comfort, and the greatest help to me in this respect. His conduct in action – and he never missed a show – was always most gallant, and by his efforts the sufferings of our wounded were greatly reduced. In every fight he worked unceasingly, helping the Regimental Medical Officer in his Aid Post, and the stretcher bearers getting wounded men in. He will be sadly missed in the Regiment. We all feel we have lost not only our Padre, but a personal friend. He was killed instantly by a shell which exploded in the Regimental Aid Post where he was sitting. By the death of this young officer, the Church, the State and the Army have lost a valuable promising life. He was buried initially on 24 October 1917 in the Cawdry German Cemetery and his body was later concentrated [moved] to Grave Reference: IV. G. 22. in the Caudry British Cemetery. Caudry is a town some 13 kilometres east of Cambrai on the south side of the main road (N43) to Le Cateau. Caudry town was the scene of part of the Battle of Le Cateau on the 26 August 1914, and from that date it remained in German hands until the 10 October 1918, when it was captured by the 37th Division. It had been a German centre for medical units, and during October 1918 and the following five months the 21st, 3rd, 19th and 49th Casualty Clearing Stations passed through it. The British Cemetery was originally called the German Cemetery Extension and was begun in October 1918 by the New Zealand Division and carried on by the Casualty Clearing Stations. It was completed after the Armistice by the concentration of graves from the German Cemetery. As well as receiving the Military Cross [MC] for Conspicuous Gallantry, Richard William Dugdale was awarded the British War and Victory Medals and the 1915 Star. His father Cecil was latterly living at Aston Hall, Aston on Clun, Shropshire, and the Register of Effects noted payments of £31-10-0d on 5 February 1919; £12-12-0d in December 1918; £2-4-2d in October 1918 and £9-10-0d in December 1918. There did not appear to be any War Gratuity – perhaps it was only for fighting personnel and not for Chaplain’s Staff. He is commemorated on the Rugby Memorial Gates in Hillmorton Road, Rugby; and in the Rugby School Memorial Chapel. He is listed on the Corpus Christie College Roll of Honour ‘DUGDALE, The Revd Richard William (CCC 1908-1912)’. In St Alkmunds Church, Whitchurch, North Shropshire there is an Ornate Wooden Altar Screen. He is also commemorated by carved figures on the Lych Gate of Holy Trinity Church. This was built as a War Memorial and dedicated after the war. The carved figures which were part of the design were added later and a report then appeared in the Rugby Advertiser. Most loveable, most gentle, and most strong, he was the ideal type of Christian priest. The loss to the Church and to those who would have come under his spell is even greater than the loss to his friends and to those who have known him and treasure his memory. His enthusiasm for reform, his humanity, and his strength of purpose assured him a future rich in honour and full of benefit to his country. Cut short on the eve of victory, his life is an inspiration and example, and his death an earnest of the truth by which he lived. This article on Rev. Richard William DUGDALE was researched and written for the Rugby Family History Group [RFHG] project, by John P H Frearson and is © John P H Frearson and the RFHG, July 2017. His uncle, John Marshall Dugdale, was a rugby union international, who represented England in the first international rugby match in 1871, and whose three sons, Richard’s cousins, were also all at Rugby School. From his obituary in the Lives of Rugbeians. Rugby Advertiser, Saturday, 10 April 1915. Rugby Advertiser, Tuesday 13 April, and Saturday 17 April 1915. Rugby Advertiser, Saturday, 29 May 1915. Rugby Advertiser, Saturday, 5 June 1915. Rugby Advertiser, Saturday, 16 October 1915. Whitchurch Herald, 2 November 1918. The National Archives, WWI War Diaries (France, Belgium and Germany), 1914-1920, Norfolk Regiment, 5th Division, Piece 1573/1-2: 1 Battalion Norfolk Regiment. Whilst the church was demolished after a fire, the Lych Gate has been preserved. Rugby Advertiser, 4 November 1921. This entry was posted in Biography and tagged 1918, Army Chaplains’ Department, Dugdale, Norfolk Regiment by Christine. Bookmark the permalink.